Everhard’s circular calender knives are made from high carbon steel or high speed steel, representing a range of hardnesses for a variety of applications. High carbon steel, having a “softer” edge than tool steel, is less likely to score surfaces during cutting and trimming. 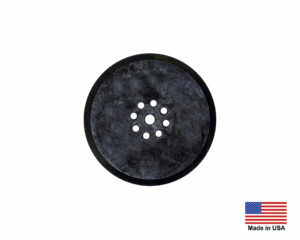 Drilled holes in the circular blade serve to index and secure it in different positions as needed.